Source citation: Rossiiskii Gosudarstvennyi Arkhiv Ekonomiki, f. 9256, op. 2, d. 358, s. 359. The map above shows fishing borders for permitted Japanese fishing in the Pacific Ocean in 1961 as agreed upon under the aegis of the Soviet-Japanese Fisheries Convention of the Northwest Pacific Ocean. Not only a map of geopolitical or inter-state borders, the document also incorporates data on migration and spawning patters of salmon as well as historical industrial fishing yields. Indeed, biological characteristics of salmon and their population dynamics determined the fishing border in the years prior to the UN Law of the Sea. The map here suggests a road not taken, what fishing borders might have looked like and the logic by which state administrative power might have been projected over the oceans. At the beginning of the twentieth century, state sovereignty over the oceans extended to a three-mile territorial sea border. International jurists and diplomats, however, increasingly doubted that these three-mile zones – recognized in Europe since the seventeenth century and codified into international law in the nineteenth – were sufficient. Fish, of course, were mobile across this border. Of even greater consequence were new technologies for industrial-scale fishing and expanded distribution infrastructures – including steam powered ships and winches, railroads, and refrigerated cars – that allowed for exploitation of fish stocks to a degree not previously possible. In the interwar period, the League of Nations took up this question within the larger framework of codifying international law in the 1920s and 1930s. Several approaches were proposed. Some jurists and diplomats, especially those from countries with developed fishing industries and wide-ranging fleets, argued that a three-mile limit was all international law could or should allow for; additional coordination in this view should take the form of bi- and multi-lateral treaties. Another option was to recognize state sovereignty over expanded tracts of ocean. Several meetings of international fisheries congresses and international law committees suggested extending territorial seas up to 4, 6 or 10 miles. This had clear implications not only for fishing but also for passage of vessels and free navigation on the open seas. Another possible model was that of Britain in the Indian Ocean, which had long asserted claims to pearl oyster beds beyond its recognized territorial seas in Ceylon as a zone of legal interest. Following several decades of diplomatic efforts and often intense geopolitical discord, the 1982 UN Law of the Sea recognized twelve-mile territorial seas and 200-mile exclusive economic zones (EEZs), which gave coastal states the exclusive right to, among other things, regulate fisheries up to 200 miles off their adjacent coasts. This story looks essentially linear. There were initially small zones of state control – a product of pre-industrial economies and technologies. The 200-mile EEZ, then, appears a logical extension of the traditional three-mile territorial sea, reflecting greater state capacity to meaningfully control large expanses of open ocean and a need for increased administration of resources given new methods of industrial fishing and expanded world markets for fish. This story parallels the account of James Scott in Seeing Like a State, according to which modernizing states required mechanisms to survey their territories and populations in ways that necessarily reduced complex, local, thick descriptions to synoptic maps legible to the outsider. Natural complexity was reduced to a small number of data points of state interest. A 200-mile border was easy to measure, map, and control. In February 1956, as talks on post-war normalization of relations between the USSR and Japan were on-going, the Soviet government announced that it had tasked its fisheries inspectorate to draw up regulations to protect the Far Eastern salmon. On March 21, the day after talks finally broke down in London, the Soviet Union promulgated the hitherto secret February order of the USSR Council of Ministers unilaterally regulating the salmon fishery out to the so-called Bulganin Line, extending hundreds of miles into the Pacific Ocean off the coast of Kamchatka and limiting Japanese fishing vessels to a fraction of its previous catch. This was a legally dubious – though not completely unprecedented – power-play by the Soviet Union to get Japan back to the negotiating table. It worked. In May 1956 USSR Minister of Fisheries Aleksandr Ishkov and Japanese Minister of Agriculture and Forestry Ichiro Kono signed a separate agreement on fishing establishing the Soviet-Japanese Fisheries Convention. It stipulated that the two sides meet annually prior to the beginning of the fishing season in May to establish measures for protection and regulation of fish stocks in the region. The Convention gave no further instructions than that the fishery was to be regulated according to “scientific principles.” Agreement was to be reached between the two sides by consensus – there was no arbiter for disagreements. In the first years of the convention, Soviet scientists repeatedly warned of imminent disaster and collapse of fisheries stocks if immediate action was not taken. The fishery, they argued, could not be regulated merely with a fishing quota (one which they accused Japan of far exceeding). A range of measures would be needed, in their opinion, including limitations on fishing equipment used by Japan, closed fishing zones, and seasonal restrictions on fishing activity. Japanese scientists and representatives, however, fought the Soviet arguments tooth and nail: it was not, they argued, at all clear that total fisheries yields were declining, nor that regulation would be needed. Japanese fishing, they argued, was fishing entirely different populations than the Soviet Union monitored. Soviet scientists were forced to admit, privately, that they did not have a good conception of either the exact mechanics of fluctuations in the salmon population nor salmon migration patterns. Soviet scientists had long monitored the processes that had taken place on Soviet territory – the progression of salmon both descending rivers into the ocean as juveniles and returning upstream to spawn. Airplane overflights of spawning streams, particularly those less accessible by Kamchatka's sparse transportation infrastructure, were also begun shortly after the signing of the fisheries convention with Japan. As a result, Soviet scientists had fairly extensive data on the bookends of the salmon life cycle. They had much less to work with on the open-ocean portion of the salmon life cycle, whereas Japanese scientists had commercial fishing data going back to the interwar period on deep water yields. Data from the Japanese fishing industry, however, was suspect for Soviet fisheries scientists: they did not believe it was either representative or accurate due to Japanese underreporting. Thus, Soviet biologists sought to expand their data with experimental fishing of their own. They also, shortly thereafter, began tagging fish, as practiced by Japanese researchers in the 1930s and also conducted by North American biologists in American salmon stocks, exemplars of which would occasionally even end up in the Soviet catch on the other side of the Pacific. Based on these methods, more general maps of salmon migration could be sketched out. Finally, study of fish scales – known to be, with restrictions, accurate means of estimating the age of fish – was also used to better understand migration patterns and life cycles. The end product was a rough estimation of the migratory routes of Far Eastern salmon. Taken together with historical yield data, maps such as that above were produced to show a mixture of biological and industrial information. Indeed, it was difficult to disentangle the two, a frequent bone of contention during negotiations. The Bulganin Line (seen on the map extending from the Soviet landmass in the top-right corner of the map south and back to the continent along the 48th parallel cutting through Hokkaido) is shown but the areas closed to Japanese fishing in 1961 – marked with diagonal stripes on the map – are based on salmon migration pathways and industrial exploitation patterns rather than a state-centered, synoptic logic. The focus on living marine organisms as the object of inter-state dispute and the foundation of the Convention, which was officially based on science – be it an ideal type – transformed the fault line of clashing Soviet and Japanese claims to sovereignty. With each passing year, regulations ratified by the two sides within the framework of the Convention mapped more and more closely onto the salmon. The Convention officially designated to science the status of apolitical arbitrator of state claims. Demarcation of state sovereignty proceeded on a dimension orthogonal to the projection of modernist state power. Knowledge claims were also claims to geopolitical power. 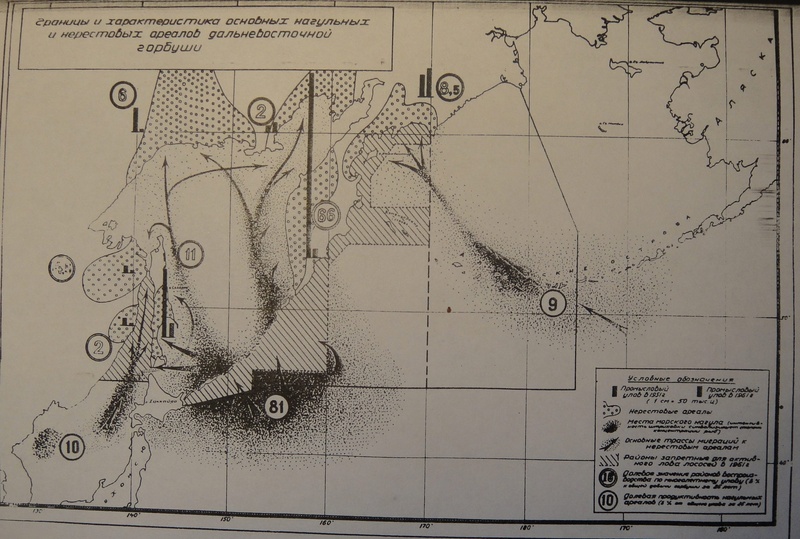 A specific type of Soviet-Japanese border arose as recorded on this document, one defined by and mapped on to the life cycle of the Far East Kamchatka-spawning salmon. The salmon themselves remade geopolitical borders and interstate relations. For more background on the Convention and an analysis of the scientific debate within its framework, see the author’s article, “Science, States and Salmon: Communicating through Disagreement over a Cold War Fault Line,” Environment and Planning A 48/9 (2016): 1864-1880.